By Aimee McCarthy | October 15, 2012. 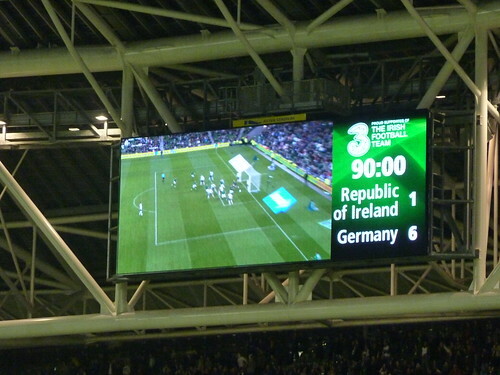 Germany sent out a massive message to the rest of Europe and the world in Dublin on Friday night following their 6-1 victory over Ireland in the Aviva Stadium. The German team took a little while to settle and could have fallen behind to a John Walters break only for brave and decisive goalkeeping from Manuel Neuer. Germany were denied a stone wall penalty when John O’Shea messed around with the ball in the box, Marco Reus won possession and O’Shea pushed him to the floor only for the Dortmund forward to be booked. But the world’s second best team did make a break through when Reus’ perseverance paid off and he expertly chipped Keiren Westwood from six yards in the 33rd minute. German player of the year Reus was in fine form and followed up with a beautiful 20 yard shot to the bottom left of the Irish goal in the 37th minute. Man of the match Meust Ozil converted a penalty after O’ Shea fouled Miroslav Klose. The Real Madrid man gave an exhibition in passing and accuracy on the ball in a star performance. The three time World Cup winners extended their lead on 67 minutes when Klose got the better of Darren O’ Dea to finish calmly from close range despite Seamus Coleman’s best efforts to clear off the line. Giovanni Trappatoni’s men looked like boys that just didn’t belong at the top table of World football, the play-off win over Estonia seems like 40 years ago now. And that wasn’t all the fun over. Tim Kroos hit two world-class goals in the 72nd and 77th minutes to complete the rout. Andy Keogh converted a Keith Fahey corner in the 93rd minute but the consolation goal wasn’t enough. Ireland play the Faroe Islands away on the 16th of October in their next World Cup qualifier.